Why our scientists sometimes need an armed guard. Everything about the man in green fatigues suggests he’s alert. His posture (erect), his lips (slightly parted), his forefinger (poised over the trigger of an AK-47 assault rifle). The man, a Serengeti National Park ranger, watches closely under the hot Tanzanian sun as ecologist Frank Masese sloshes around in brown river water with a net. Masese is absorbed in his work, collecting bugs that will indicate the health of the Mara River. The ranger is there to make sure that in his search Masese doesn’t accidentally find any crocodiles. When doing work to preserve one of the most important ecological landmarks in the world, that’s part of the occupational hazard. Ecologist Frank Masese collects insect specimens for the IHE Delft team’s environmental flow assessment of the Mara River. An armed Serengeti National Park ranger stands on the lookout for crocodiles. Photo by Michael McClain. Masese is a leading expert in the ecology of East African rivers, of which perhaps none is as important — or endangered — as the Mara. Despite its modest size, one million people in Kenya and Tanzania depend on the river and its tributaries in the broader Mara River Basin for water. The Mara is also the lifeblood of the area’s globally renowned ecosystem. It flows through Kenya’s Maasai Mara National Reserve before crossing over into Serengeti National Park in Tanzania and emptying into Lake Victoria. These wildlife reserves are known for their population of African elephants, lions, cheetahs, leopards and rhinoceros. From July to October each year, wildebeest, zebra and Thomson’s gazelle migrate in the thousands to and from the Serengeti in what is known as the Great Migration. To do so, they must cross the Mara, where crocodiles lie in wait, a dramatic scene that has animated more than a few National Geographic documentaries. Yet despite its importance, the Mara River is under stress. The river has suffered from deforestation, overextraction from irrigation and water-inefficient agriculture, and increasingly extreme droughts and floods due to a changing climate. Should degradation of the river continue, it will deprive humans of water, disrupt the area’s famous ecosystem and damage the local economy, which depends on tourism and agriculture. Winrock International’s Sustainable Water Partnership (SWP) is spearheading a three-year USAID effort to support government authorities and local people in safeguarding the Mara, ensuring that both humans and wildlife will have enough water to sustain life into the future. Two SWP partners, the German development agency GIZ and the Nile Equatorial Lakes Subsidiary Action Program, have enlisted a team with the IHE Delft Institute for Water Education in the Netherlands to study the current state of the river. The data collected by the IHE Delft team will inform the way this crucial ecosystem is preserved in the years to come. 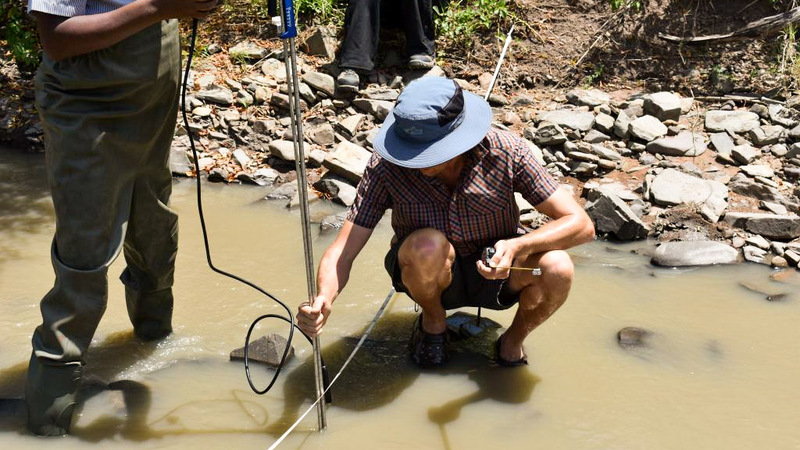 Dr. Bennie van der Waal of the IHE Delft team takes a discharge, or flow, measurement in the Mara River. Photo by Gerald Itimbula. The IHE Delft team includes a hydrologist, hydraulic engineer/geomorphologist, a water quality specialist, a social scientist and three expert ecologists to study fish, plants and insects. Masese is studying whether the bugs have enough space and water to survive without undue stress at each stage of the river. His findings will also tell a story about the river’s capacity to provide for the people who rely on it. If humans are to continue using the river, it must first preserve a baseline flow that ensures its survival into the future and that provides the habitat for the fish, plants and insects that anchor the region’s renowned ecosystem. 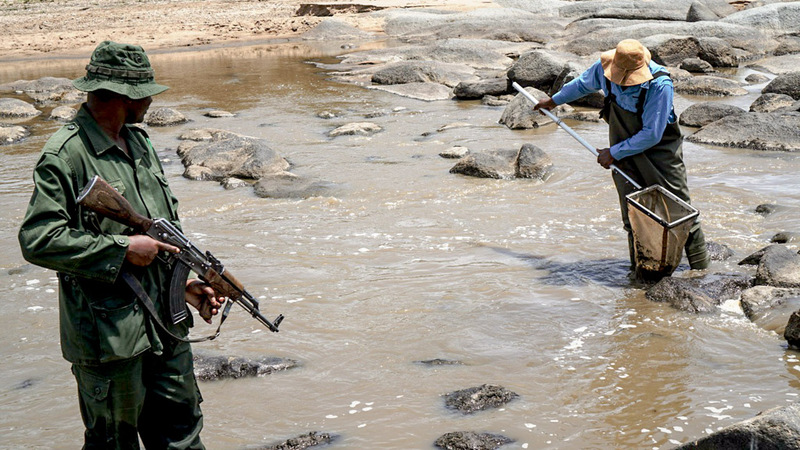 Professor Michael McClain, who is leading the IHE Delft team and who captured the photograph of Masese at work under armed guard, says a healthy river rejuvenates itself at each of its stages, in both wet and dry seasons. Plants, animals and insects can carry out their normal life functions, spawning, growing and contributing to the larger food chain. “When all those things are happening,” McClain says, “that river is providing a whole range of services to people. People are provisioning, making use of the water, plants and animals” by consuming them or putting them to use for construction or medicinal materials. Andrew Husted collects fish specimens for identification and measurement for the IHE Delft team’s environmental flow assessment of the Mara River. Photo by Gerald Itimbula. IHE Delft’s study will build on other efforts SWP is facilitating in the Mara River Basin, such as working with water users in key tributaries to develop long-term water management plans. The plans call for protecting important water springs by restoring vegetation through the planting of more than 10,000 indigenous, water-friendly trees, and addressing soil erosion by constructing terraces along tributary slopes. SWP is also working with farmers to adopt alternative livelihoods that enhance rather than harm water security, such as planting and cultivating fruit trees. Combined, these efforts will ensure that the Mara continues to provide a safe home for bugs, fish — and even crocodiles.